A more luxurious choice of winter sock, our SockShop of London Mohair Knee High Socks are soft, silky, comfortingly weighty and dense, with a deep cuff and ribbed legs. Made with 80% mohair fibre, the socks have superior, highly versatile insulating properties, warm in colder temperatures, but allowing the escape of moisture with its ability to wick away sweat. The soles of these long socks have brushed loop pile protective cushioning, making them highly suitable for wearing with walking boots and using for outdoor activities. 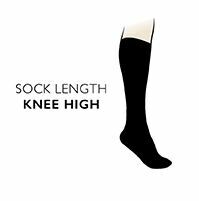 SockShop of London Mohair Knee High Socks are made here in the United Kingdom.